Someone crawled into my bed this morning at 5:30 a.m. Someone is so excited this morning, and has not adjusted to the time change yet. Today, Lily is 9 years old! Since I have been participating in NaBloPoMo every November for a few years, Lily always gets a birthday post. Emmy’s birthday, however, is at the end of July. This summer it was right in the middle of BlogHer13, VBS and our Grand Canyon vacation. I mean to blog about Emmy’s birthday, but somehow it slips right past me. This summer, Emmy turned 6 years old! 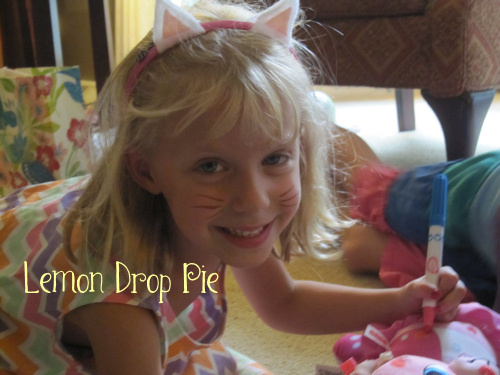 Emmy is kitty-crazy, so she planned her own kitty birthday party. We rented a room at the park district, ordered a bunch of pizzas, and invited 30 of Emmy’s friends. To my amazement, most of them came! Fortunately, my sisters were there to help me with our crazy party; I meant to take more pictures, but Emmy’s guests kept me very busy! Emmy wanted to play cat cat mouse (the cat version of duck duck goose), pin the tail on the cat, and going on a mouse hunt. Party favors were kitty ear headbands and little fuzzy toy mice. Everyone had a meow-velous time! This past weekend, the family celebrated Lily’s 9th birthday. Lily does not like birthday cake. At first, it broke my heart because I wanted to make her homemade birthday cakes just like my mom did for me growing up. I’ve learned that I can still make Lily fun desserts, but they are just not traditional cakes. Last year, I made homemade strawberry shortcake. This year, I made a layered Jello dessert with an Oreo crust. My sweet daughter loves fresh berries, so I topped it with raspberries. Over 9 years ago, I gave up my teaching job in a top suburban school district to stay at home with my baby. To this day, it is a decision I still struggle with; I loved my job and spent 13 years in the classroom. Motherhood is the best thing that has happened to me, and I love watching my little girls grow up. I’m so proud of all the things they have already accomplished. Happy Birthday to both my sweet little girls! 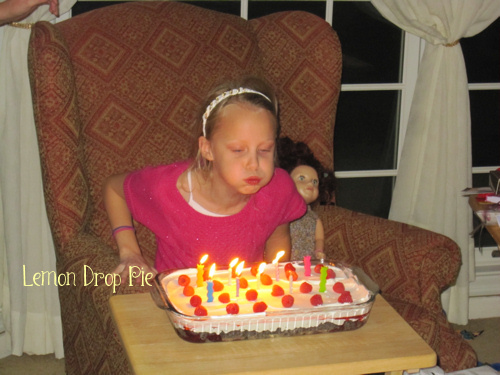 10 Responses to Birthday Birthday! Wow that was a big party Emmy had, glad you got your sisters to help. Happy Belated Birthday to Emmy. Looks like Lily had a nice celebrations too. Happy 9th Birthday Lily! Happy Birthday to both of your beautiful girls! Forget birthday cake-I’ll take that yummy dessert! That cynking feeling recently posted…Free for all! That layered Jello dessert with the Oreo crust sounds yummy! I think I had something similar on the baking blog back in the day. Yes, you did! It’s basically the orange dream dessert you made; I just changed it a little. Ginny Marie recently posted…Birthday Birthday! I didn’t like birthday cake much when I was a kid. My mom would make me “Hershey Pie.” I totally thought she made it up, but no, it’s a whole tub of cool whip in an oreo pie crust, and she’d break up tons of hershey bars into the cool whip and then freeze it for a few hours. Beautiful girls! I gave up teaching to be a SAHM as well over 11 years ago. I hadn’t bee teaching as long as you at that point. It is the best decision I ever made, but sometimes I do still miss having an outside the home job. Happy birthday to your sweetie. Love the pictures and entertaining almost 30 guests? Whew! I’m glad you had help.